More Microtech goodness. The Amphibian is my favourite of the Microtech side-opening automatics. Beautifully machined and finished hard annodized aluminum handles, with 14-4CrMo steel from Latrobe, which is similar to 154CM. I picked this one up a while ago and had drooled over one for a long time before actually getting it. It was one of those knives that caught my eye immediately, and upon receiveing, did not dissapoint. Not even a bit. The beautiful stone washed, recurve blade of 14-4CrMo steel is fantastic. As I mentioned in a previous review, 14-4CrMo is a steel made by Latrobe that is the equivalent of 154CM maybe by Crucible. 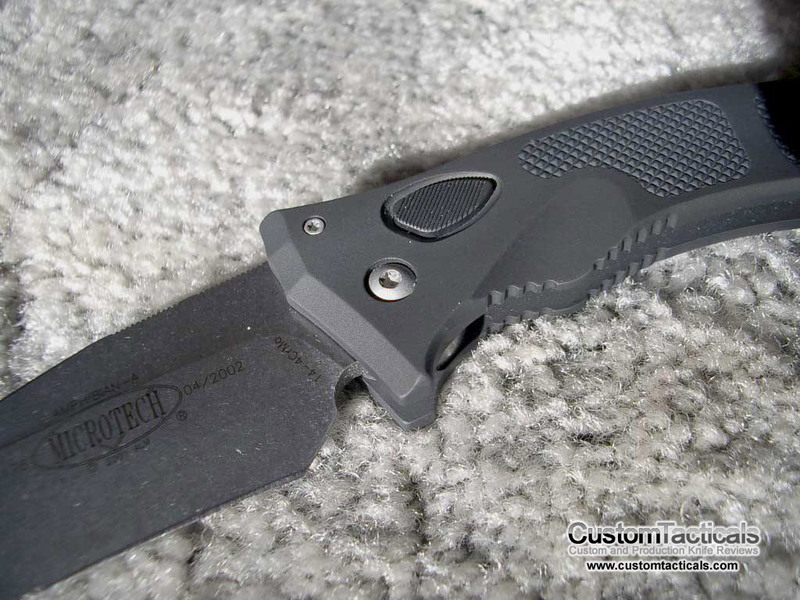 Microtech used the 14-4CrMo during a period when 154CM was not as available. It essentially performs almost exactly the same. Newer versions of this knife come with S30V steel. The grey annodized aluminum scales have Krayton rubber inserts on one side, with a pocket clip on the other. Firing buttong is sort of an oblong almost football-like shape. The curved handle gives it a great grip with superb retention. 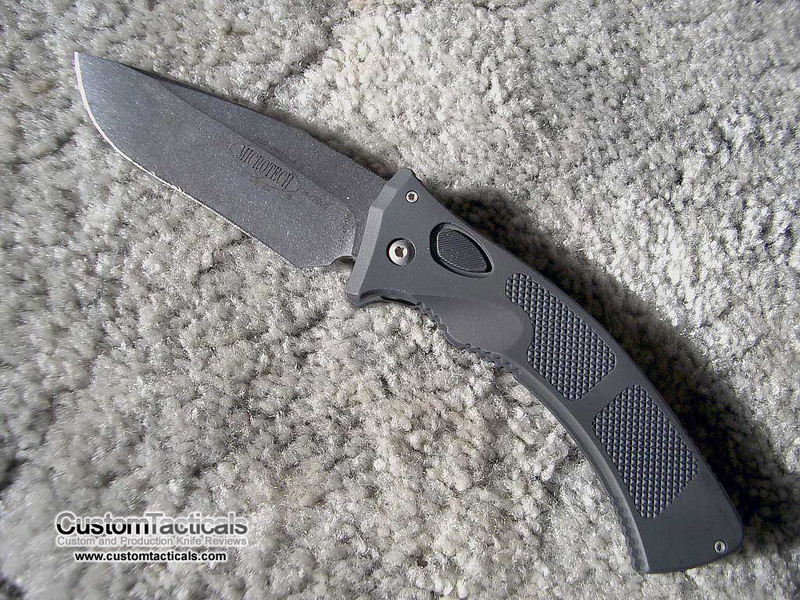 The Microtech Amphibian is a very versatile knife because of these features. The big belly on the blade does pose a problem for some urban mall ninja tasks such as opening letters and packages, where the belly isn’t quite as useful. Blade fires strong and hard, fit and finish is perfect as it usually is with Microtech. As much as I love how the aluminum handles feel when using the knife, I dont like how they are not easy to refinish when scuffed. With Titanium such as on a Sebenza its easy to just re-blast it to take the scuffs out, which for me makes it easier to use a knife the way it was meant to be used. All in all this is a great knife with a great ergonomic feel and unless the blade shape isn’t what you are looking for, would be a great choice as an auto. I’m looking for a microtech mtx2 da carbon scales. Please let me know how I may find one? Not sure off-hand… try Microholics?